Nobody knew what to expect out of the first major written and practical exam covering all of the recipes and techniques from the tarts and cookies unit, and so we all spent most of the weekend studying everything that we’ve learned to date in order to prepare for just about any question that might be thrown at us. The written exam turned out to be fairly straightforward in the end, with lots of essay questions on how to make certain staples in pastry such as pastry cream and pate brisée. There were also the standard multiple choice and fill-in-the-blank questions that dealt with a wide range of techniques, terms and specific recipes. There was a number written on each test that corresponded to what each student would be baking for the practical exam. 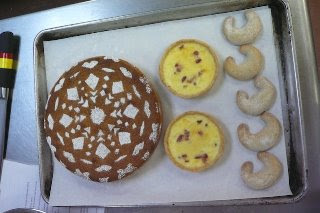 I had number four and made a caramel nut tart, quiche Lorraine, and vanilla crescent cookies. There were a total of four different recipe combinations assigned to various students at random and I was certain this would result in a chaotic clamoring about the classroom as we all ran for various ingredients and tools in order to complete the assignment and show it to Chef Cynthia by the end of class for evaluation. And it did... but overall, it went a lot smoother than I thought. Joseph Sardini, my partner for the entire first unit and a father of three boys who lives in New Jersey, made an apple tart, spritz cookies and blueberry clafoutis as part of his practical exam. The evaluation by the chef, which she did individually, was helpful in that she gave constructive tips on things each student could do to improve their baking skills. As soon as she was finished with the last person, it was onto a brand new unit... pâte à choux! Paris Breast, profiteroles, and éclairs all are made with pâte à choux dough, which consists of bread flour, water, butter, salt, and sugar that is cooked on the stove and then mixed with as many eggs as possible, without becoming runny, before being placed in a piping bag and squeezed into various shapes. The dough more than doubles in size in a hot oven using the power of steam that is derived from the moisture of the eggs, butter, and water. We’ll be spending the next week baking many recipes that use pâte à choux dough, as well as a few other related recipes that rise using similar principles, such as popovers. I'm looking forward to it!